It's not often that I revisit a pattern. But, I'm proud to say, The Penny Sampler was worth revisiting. It is a complex quilt, both the sewing and the fabric selections. Meeting that challenge for a second time allowed me to gauge my sewing skill progression and was certainly a growing experience in color. My first Penny Sampler was pale and wintry, in shades of white, blue and purple inspired by Scandinavian weather. This year's Penny Sampler is quite different. It was inspired by the way stained glass shines in cathedral windows. I used dark neutrals to frame the jewel-colored center blocks, exercising restraint in my fabric selections and taking a leap of faith into an unfamiliar palette. I like it. For one, I like it because it's different. Making something in new-to-me colors has that element of discovery that I crave in my quilting journey. For another, I like it because it works. The dark border-ish frame does intensify the saturated fabrics used in the center. Hurrah. Choosing solids for the frame was a critical step for this Penny Sampler. I didn't want to use black, which would be too jarring, but I wanted it to feel dark and even a little mysterious, like a holy place. Freespirit Designer Solids has a shade called Cosmic Blue that really spoke to me. 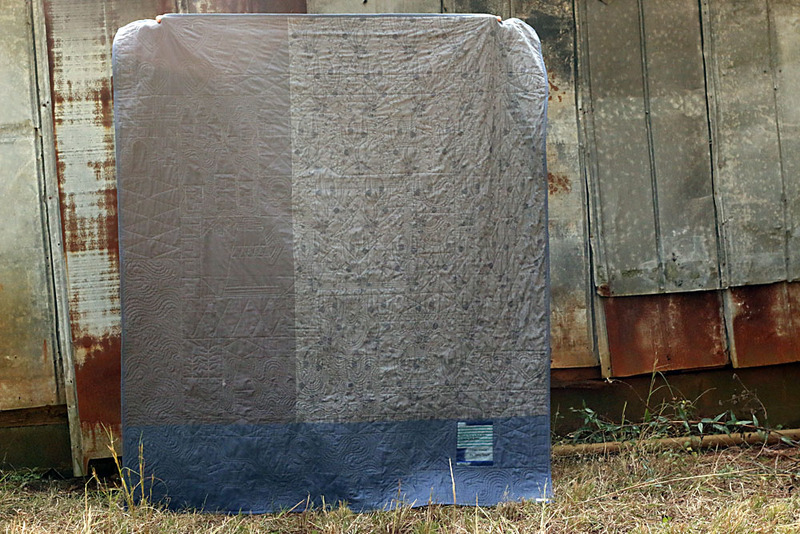 It's the blue-gray that I used most liberally on the quilt top and here across the bottom on the black. Freespirit Solids Lavender, Wisteria, Pomegranate, Denim and Royal also made appearances, plus Konas Coal and Charcoal. 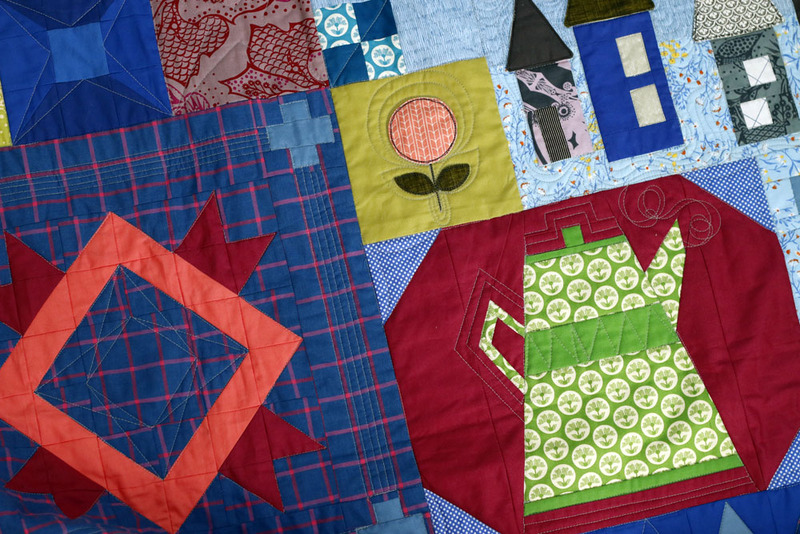 The quilt also features many fabrics by Anna Maria Horner, who has a proclivity for jewel tones. Ok, now you have to look closer to take in the quilting! I sent the completed top to Emily Sessions of Emerson Quilting, who is one of my sponsors. She did a beautiful custom quilt job! I asked her to avoid really dense custom quilting, as that's not my style. She followed through by echoing motifs and using negative spaces in the quilt to recreate shapes like the little houses, birds and diamonds. When I noticed the steam rising from the tea pot, I gasped with delight! Some of my favorite elements are over the geometric blocks. She added simple, lovely little touches that add to the patchwork without outshining it. That's just what I wanted. I'm also drawn to the swirly pattern she quilted through the Little Village and Spruce Forest blocks. It creates the feeling of snowy, windy weather. Emily does all of her longarm freehand. She enjoys all-over quilting or custom projects. I can heartily recommend her services. I gifted my original Penny Sampler quilt to my grandmother. I think I'll be keeping this one for now. Designing this pattern and producing the course was such a growing experience for me as a maker. I learned a lot for myself and had the pleasure of teaching many of you. Thank you! I don't think I'll be offering the Penny Sampler as a course again, but perhaps as a stand alone pattern down the road for intermediate quilters who don't need the full breadth of the course contents. Thank you for joining me on this adventure. It's been epic!